A sociable weaver’s nest in the Namib Tsaris Conservancy. Made of twigs and branches, it can house up to 300 birds. Right, the Reserve’s new guest lodge, inspired by the birds’ spectacular communal dwelling. Photos: Katinka Bester. 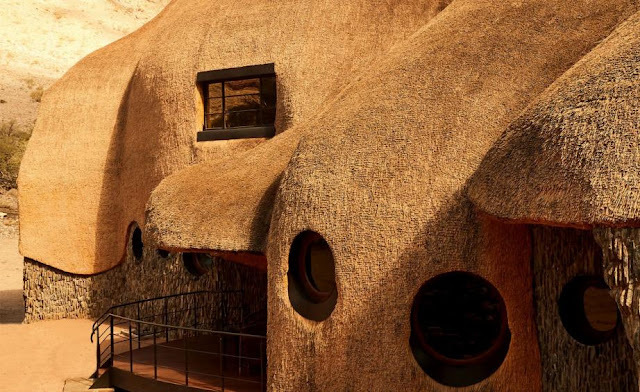 NAMIBIA: A secluded African desert, a retreat place with a nest-inspired thatched-hatchet house that modelling weavers's nest. This secluded retreat in the Namib Desert is the fantastic new building done by South African designer Porky Hefer, who took cues from his ‘Nest’ furniture series, upscaling and extrapolating architecturally, conceived for conservationist Swen Bachran. The house is thatched with reeds collected from along the Zambezi River, providing natural insulation, while the bricks and steel frame were handmade on site. Inside a sunken lounge there is a leather banquette that pays homage to the organic style of the late American architect Bruce Goff. Key features: African hardwoods, organic forms and handmade bricks and others available materials. 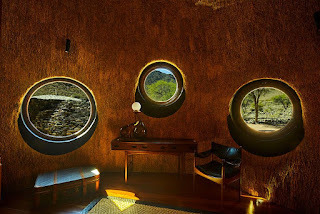 This magnificent designed lodge is just from the gates of Namib Tsaris Conservancy, a private reserve located in a remote valley of the Namib Desert, it’s a 30km drive to The Nest. The journey is best undertaken during the day, for at night, stars alone illuminate the dirt roads, and leopards and hyenas prowl the land. On approach, a swimming pool and a grid of solar panels are the most visible signs of human life, for the isolated hideaway itself, with its thatched roof and soft lighting, is a barely-there silhouette in the landscape. The nearest town is 125km away and wildlife, which congregates around a floodlit watering hole, provides the only company. Seclusion is just one of The Nest’s selling points. On hand are a local chef, butler and guide, as well as a helipad. It’s a short flight to the World Heritage Site of Sossusvlei, home to glowing red sand dunes, and Deadvlei, a graveyard of 700-year-old camel thorn trees. 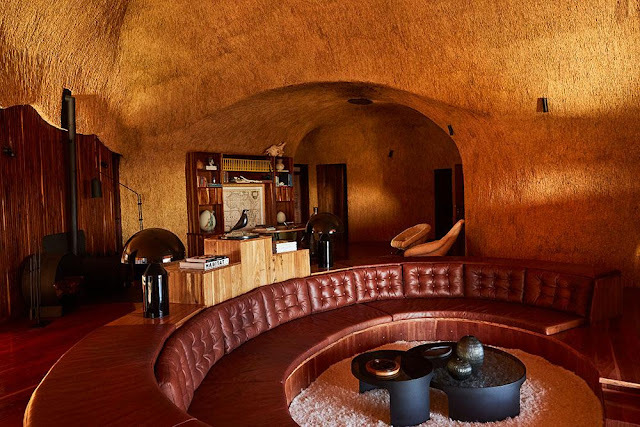 In the living area, a sunken lounge with leather banquette pays homage to the organic and experimental work of the late American architect Bruce Goff. Photos: Katinka Bester. from the banks of the Zambezi river, Namibia. Porky Hefer and Swen Bachran are the owner of the 24,000-hectare conservancy, camped out. 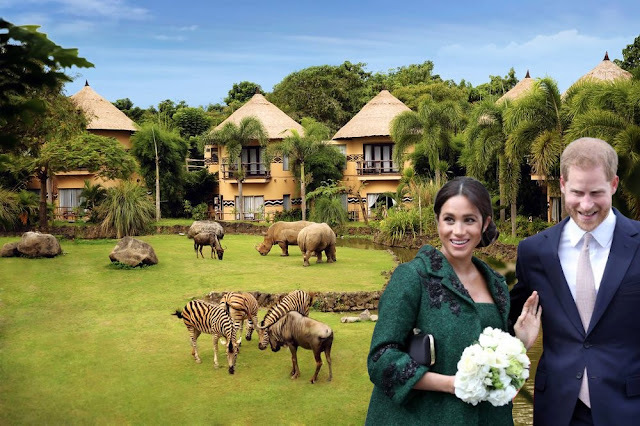 They had come to survey the site as a location for a dwelling that could be a scaled-up version of the ‘nests’ – pod-like furniture – that Hefer was becoming known for (last year, one of his ‘Humanest’ hanging chairs, handwoven in kooboo cane, sold at Sotheby’s for £12,500). 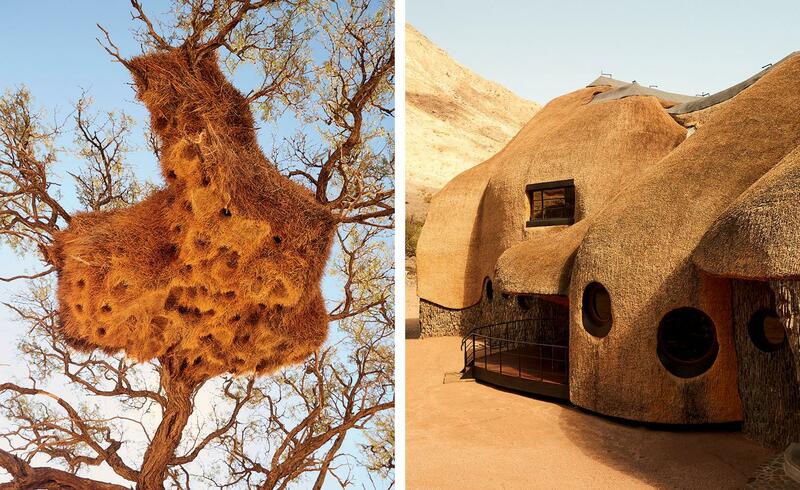 While they dreamed up their crazy scheme (Hefer had never designed a house before and materials would need to be transported from 480km away), they observed the vast, labyrinthine nests of the local sociable weaver birds. Such nests can house hundreds of birds, who gather in different ‘rooms’ – outer, cool spaces during the day, and warm, inner areas when night-time temperatures plummet. Why not apply their efficient techniques to a house for humans, thought Hefer? It was an organic process, we built everything on site using local artisans and materials in the traditional style of the area. Building off the grid was both a difficulty and a blessing,’ explains the designer, who spent three years finding a local builder up to the task. ‘It meant we could do what we wanted but logistically it was insane.’ Audience participation was also a hindrance: baboons dismantled the outdoor shower and a leopard cub shacked up under the foundations. Hefer and his wife, designer and curator Yelda Bayraktar, began work on the interiors, later handing over to Cape Town specialist Maybe Corpaci. They opted for ''built-in furniture, much like that of a nest, accented by a few great pieces with a modernist touch''. In the living area, a sunken lounge with leather banquette pays homage to the organic and experimental work of the late American architect Bruce Goff. Photo: Katinka Bester. While Hefer drew every last detail, Bachran was on a quest of his own. In 2010 he had bought the original plot of land, that he used as a weekend escape from Windhoek and Cape Town, where he runs property businesses. He soon acquired more land since he was fueled by a passion for nature. The area was once populated by abundant wildlife, thanks to its almost year-round natural pools and waterfalls. Bachran installed new roads, removed miles of fencing and is gradually reintroducing antelopes, zebras, giraffes, big cats and rodents. There are plans to reintroduce the endangered black rhino too.